BIG THANK YOU FROM SMALL SCHOOL | JOLLY JACKS JUMPING CASTLES! 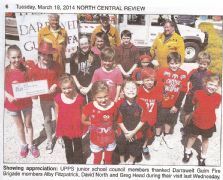 A RED fancy dress day and barbecue fundraiser at Upper Plenty Primary School last week raised more than $977 for the Darraweit Guim Fire Brigade. The event was organized to thank the fire fighters for their efforts during the Mickleham – Kilmore fires and was a collaboration between the junior school council and a team of volunteers. Students also had the opportunity to thank fireys in person for their work during a special visit on the day. Darraweit Guim Fire Brigade volunteers Alby Fitzpatrick, David North and Greg Head were overwhelmed by the response from the school community. “Darraweit Guim is only a small town, like Upper Plenty Primary is a small school, so it can be hard to raise funds. The school’s effort is most appreciated,” Mr Fitzpatrick said. The brigade currently has 14 active members from Darraweit Guim, Wallan and surrounds and is calling for more people to become involved. “Anyone can contribute and there is a sense of satisfaction in volunteering work and assisting the community”, Mr Fitzpatrick said. The day was made possible through volunteer efforts and donations of foods and goods through various businesses in the area. Principal Kim Laffan said the day was the brain child if Stacey Abbot who worked with Kaylene Watts to bring the event together. She also thanked Julie Bourke, Noral Maher, Fiona Stokes, Rosie McLoughlin, Jodie Carland, Kelly Sanders, Kate Leduc and Christine Chetcutti who volunteered assistance on the day. She also thanked sponsors Jolly Jacks Jumping Castles, PJ Meats, IGA Whittlesea, McDonalds Wallan south bound, Dench’s Meat, Bakers Delight Whittlesea, Coles Wallan and Wallan Safeway for their contributions.